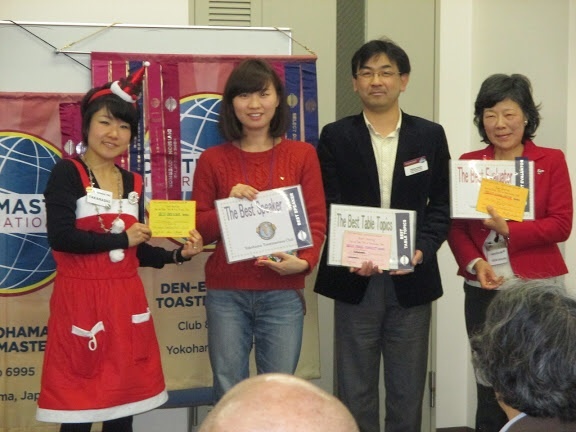 Our Joint Meeting by Yokohama TMC and Den-en Toshi TMC has been successfully done on Dec 20th, which was a last meeting in 2014. Although it was a heavy rainy day, many members gathered the venue and the meeting went very well and finish without any issue! Another theme was ‘Christmas’, so many members worn Christmas costume and some members were dressed in Red, Green or While. So, the atmosphere in the meeting room was really bright like Christmas!! 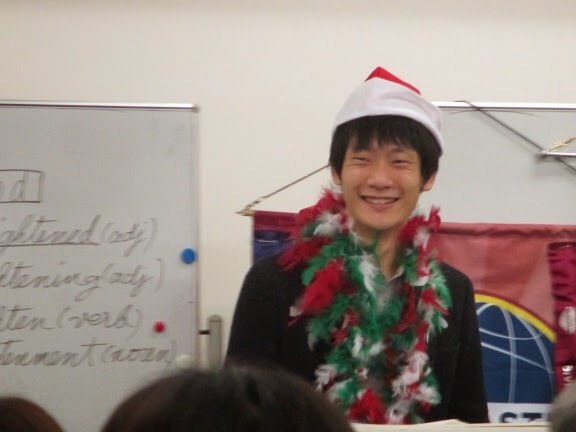 The meeting started on time by opening remarks from Yokohama TMC President, TM A.T.
At the begging of Table Topic Session, Santa Claus appeared!!! And….. he was TM Y.O of Den-en Toshi TMC. He really looked like a real Santa Claus he gave us a lot of fun during the Table Topic Session. Another Table Topicmaster was TM T.T and both of them gave us the questions related to a meeting them. Today, we had 6 Prepared Speakers. 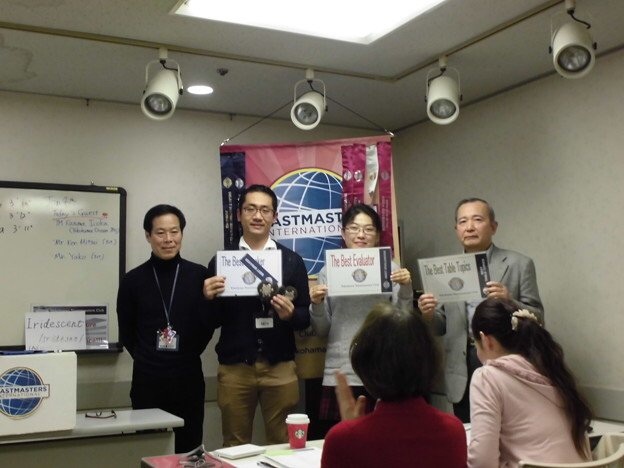 From Yokohama TMC, TM M.O, TM T.S and TM H.A challenged to be a Speaker. I am sure that they were very nervous because the meeting room was very big and more than 30 members in the room. TM M.O did a great speech even it was her 2nd speech and she shown us many pictures of Ukraine using PC. TM T.S gave us a tips how to survive in our social field and explained his way with a philosophy. I enjoyed listening his real story and his experiences. The advanced speech by TM H.A was about the book written by Sheryl Sandberg. She not only explain the story which she read but also explained what she leaned from the book and how she felt. She did a wonderful job!! Not only 3 speakers but also evaluators and all support role takes did great jobs during the meeting!! Without all helps by supporters, the meeting wouldn’t run well. The award winner was below. Congratulations to all winners!! The meeting ran smoothly according to the agenda and Den-en Toshi TMC President TM K.O made a closing remarks and our joint meeting finished on time!! The key purpose of joint meeting with Den-en Toshi TM Club was to communicate with each other and learn each other the differentiation. 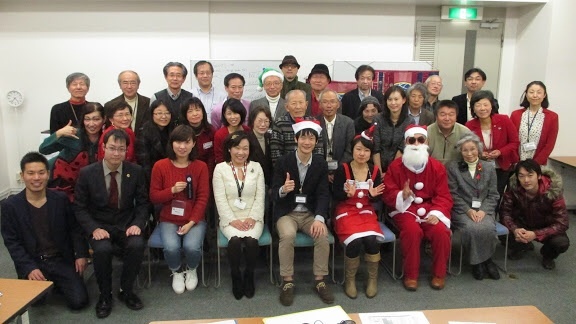 I hope that everyone enjoyed the meeting and learned something from Den-enToshi TMC members. As a TMOD, I’d like to say thank you to all role takers and thank you for supporting me during the meeting. The 587 YTMC regular meeting was held on January 4th(Sunday), 2015. We had 16 YTMC members, 1 other TMC member and 2 pure guests. So the number of participants was 18, even though the day was the last Sunday of New Year’s Holidays. I really appreciate so many people coming to our New Year’s meeting. We were able to enjoy three advanced speeches and a thoughtful workshop by our President and communicate with participants and laugh a lot like Hatsu-warai. We Yokohama TMC started 2015 toastmastering successfully. Hopefully, we would like to improve much more than before with a fresh motivation.